See the Machine in Action! Balloon Hats and Banjo Music – Rich Pearl's Hat Wagon takes balloons to a new level. Yes -you've seen balloon hats before and you can usually get one if you wait long enough for the local clown to finally get to it; after he creates a variety of balloon sculptures for a few people - they take a long time to make you know. Rich's new Hat Wagon changes all of that. It produces up to 100 Balloon Hats/hour and you and your child even get to pick out your own color from a large selection displayed in the "Flavor Box". As you watch and laugh, the balloon seems to pop out of the machine inflated by a battery operated high volume pump. This new double pumper (two individual pumps) allows continuous action for up to one hour The line really moves as the kids and adults (large kids) walk away entertained and happy with their new find. Oh yes - the music - it never stops as Rich and his machine stroll down the path with people asking, "When are you going to stop?" When he does, crowds instantly gather to see this new cool machine do its thing. People watch and listen as the built in 200 watt sound system presents Americas only instrument, the banjo, playing a wide selection of happy music designed to enhance the show. But when everyone has a hat what then? Well, Rich releases the parking brake and moves - on perhaps to an area in need of a little musical entertainment! Down comes the stool and out pops the banjo to play for the crowd, eating in the loafing shed or hanging out in the entertainment pavilion or even on a stage where some folks have gathered to wait for another attraction. Oh yes, just in case, the Musical Comedy Game Show is on board as well. Mobility is "no problem" as a new crowd once again spots the moving Hat Wagon. Rich announces, "Hats or Straits. Just pick out your flavor (color) and I'll get you cookin!" - watch those folks come a runnin'. 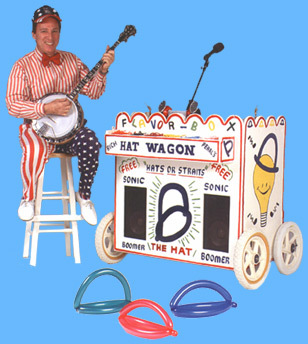 This go anywhere, balloon blowin', music makin' wagon will entertain your folks, create a great crowd pleasing environment and leave everyone feeling like they had a "real good time". All those people sporting their new hats leaves no doubt - the "Hat Wagon" was there! Contact Rich to request more information or a complete press kit.